This innovative volume describes how an awareness of culture must be applied to the study and provision of welfare in Europe. It shows how the cultures underpinning social welfare systems are starting to be exposed and explored. The assumption that the values and beliefs which constitute welfare systems are universal and absolute has been overturned for two reasons. First, the post-war period has seen huge changes in traditional structures in Europe, such as class, race and gender, which have prompted people and systems to re-assess and assert their identity and role. Second, the move towards European union and the process of globalization have led to a growing awareness of different welfare systems; traditional distinctions, for example between the individual and the community, the public and private spheres, and the state and the market, have had to be re-evaluated. Defining `culture’ as the systems through which social orders are transmitted, experienced and explored, Welfare and Culture in Europe argues that welfare must start with the human individuals involved – the users, providers and policy makers themselves. It constitutes a major qualitative study of the ways in which welfare states reflect and reproduce patterns of social values. Several chapters draw on new biographical approaches to social policy research and analysis. It develops new directions for future policy research and presents alternative methodological bases for empirical work. 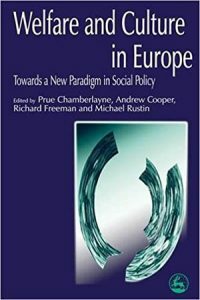 At a time of crisis, change and anxiety in Europe, this book lays the foundation for an essential re-working of social policy.